Are you looking for ways to spruce up the style of your home? Look no further than decorative concrete, which can be a great change to your kitchen countertops, floors, outdoor patio, and hardscape. Decorative concrete is durable, beautiful, and just enough out of the ordinary to impress your family and guests alike. No matter what your existing home décor is like, you’ll be able to find a color and finish of decorative concrete to match. Read on for tips on how to choose a color and finish for your concrete. Your personal design aesthetic is the best place to start when you are picking a color and finish for decorative concrete in or around your home. Look at the dominant colors that you favor currently, and decide if you want to stick with this color scheme or go in a new direction. 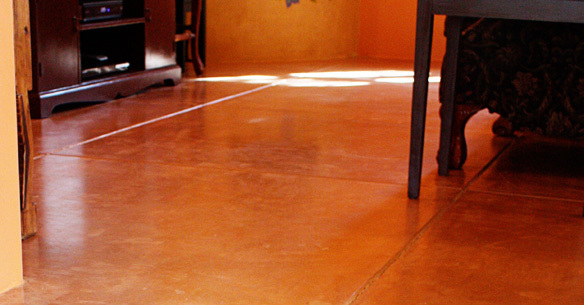 If you are a more conservative decorator, you may want to choose muted colors and matte finishes for your concrete. If you want to highlight this unique decorative element, choose a color that will stand out from the rest of your décor without being overly loud. Decorative concrete comes in a variety of finishes that look great in almost any setting. You may want to choose a non-slip finish for use around your pool deck, while a smooth finish in the garage can make sweeping up a bit easier. Trends in interior design come and go, but there are always a few elements that stand the test of time. Choose colors and finishes of decorative concrete that you think will suit your tastes for years to come. The good news is that decorative concrete has a subtle beauty that should last for a long time. Zona Decorative Concrete & Construction, LLC is here to help you revamp the inside and outside of your Tucson area home. Call us at 520-495-4919 for a free estimate, and to inquire about how you can use decorative concrete to your design advantage.